Earlier today, Marvel Studios released the first teaser poster for Black Panther ahead of the film’s first teaser trailer, which aired on television tonight during the NBA Finals. The teaser trailer is now online — watch it here below! The film will see Chadwick Boseman reprise his role from Marvel’s 2016 superhero ensemble blockbuster Captain America: Civil War. Rumor has it that the movie will have a Game of Thrones-esque story that will see the title character battling to keep the throne of the technologically advanced nation of Wakanda. And from this first trailer, we not only get to see Wakanda, but plenty of violence to come. There’s also a throwback to Black Panther’s epic car-chase battle from Civil War. 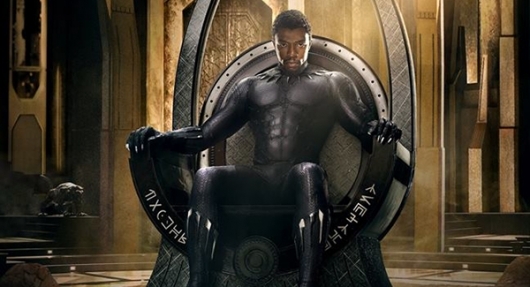 Directed by Ryan Coogler‘s (Creed) and starring Chadwick Boseman, Michael B. Jordan, Lupita Nyong’o, Danai Gurira, Daniel Kaluuya, Angela Bassett, Forest Whitaker, Andy Serkis, and Martin Freeman, Marvel Studios’ Black Panther opens in theaters on February 16, 2018.